Scorpio is the next sign of the Zodiac to look at with regard to the Moon and Moon energy. When one thinks of what the Moon stands for, things like emotional security, empathy and domestic issues. Scorpio tends to be a very intense energy so not a great place for the Moon. Here one might have the tendency to be too intense. The determination of the energy of Scorpio can weaken the energy of the Moon. But as with all the signs of the Zodiac there are ways of using that Scorpion energy. 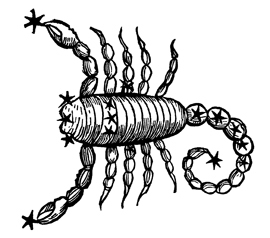 With the determination of Scorpio it can be great for larger tasks; it can be great for ferreting out information, even taking a larger interest in mysteries. If the Moon represents the Mother, then in Scorpio it would seem that the mother was seen as intense. Maybe the mother was seen as running her house with manipulation or even guilt? At least this is how the native saw his or her mother if they have Moon in Scorpio in their natal chart. If we apply even that small amount of information and apply it to the transiting Moon regardless of what sign you are, there will be a greater feeling of intensity during it journey through the sign of Scorpio. The energy here tends to be more serious as well as intense. There can be a focused energy here to the point of feeling determined or even driven to get to your goals. By the same token if you feel that you have been taken advantage of or manipulated by someone else, the opportunity to take your stand or present your findings. During the journey through Scorpio is a time when there is more determination to get to the truth. By the same token, those who want to manipulate can also take advantage during this time to do just that. This is a time when some people can turn a bit vengeful. It can also be a time when whether we want to or not we seem to be reminded of slights that have been done to us bringing up issues of resentment. The Moon is also about our memories, particularly past memories. So when the energy is running through the sign of Scorpio those memories can often be of the bad things we have been through and how others may have manipulated us. It is also a time when there can be more awareness of the not so pleasant past and in some cases when someone is going through other difficult transits a day when the Moon is in Scorpio can bring things right up to the surface causing more hard feelings or more interest in things like revenge. It can intensify that “bad” feeling. By the same token, it is something new happening in the native’s life, the Moon in Scorpio can make them more either more determined to hold to what they have or it can make us more obsessed with what e ver it is we are involved in at the moment. Now this can be good as well as bad. As I pointed out earlier, there is an element of curiosity with this energy. There is a great need to ferret out the truth and to do one’s homework, whatever that might be. If you are interested in more predictive articles you will want to check out the New Moon Predictive Article written each month. Come check out and see what’s in your stars??? ?